Where do I start with a summary of this one? First, thanks to Imran and the team for putting on another great con, enjoyed myself a lot once again, for the time I was there (more on that later). 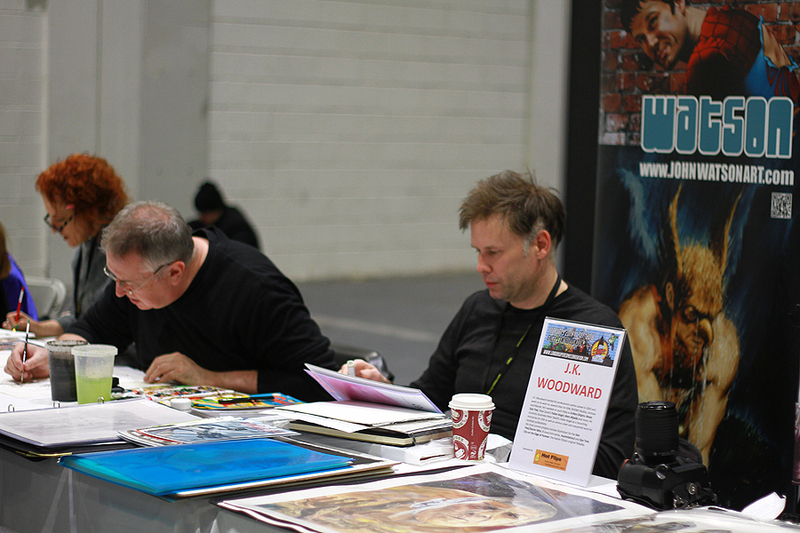 I also enjoyed my table placement this year as I was seated next to JK Woodward, a fine artist and good company! Thursday night I thought it was time to price up my art I'd brought to sell. 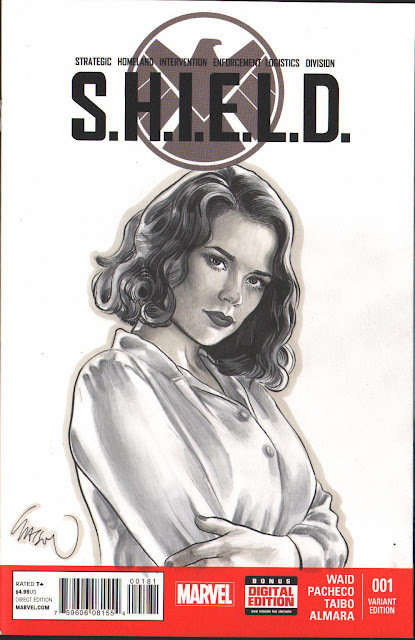 Now, after previous disasters involving missing folders of art at the 2013 con*,before we left for Scotland I made sure I had all the commissions I'd done in a folder, all the blank sketchcovers, all the stuff to sell in another one. I gave Russ Payne a folder of heavier stuff, to avoid it getting damaged (with paintings and oversized art inside) my banner and my prints before I left and he promised not to lose them. I'd meet him at the con Saturday morning. I'd booked a train ticket months previously that took me straight from Perth to London King's Cross. I planned to buy a book and enjoy a relaxing time before the weekend. So, I began putting stickers on the art I had to sell, pricing it up. I began to make a list of comissions, matching the name with the art. There was a folder missing. I looked four times. It wasn't there. My wife wasn't impressed when I Facetimed downstairs (my 8 month old son had fallen asleep on my legs and I didn't want to wake him) and she assured me nobody had a key for our house back home (I was hoping Russ could get a key, find the art and bring it down). I was going to tell him an easy way to break into my studio but it wasn't feasible. Next I figured I'd just collect the money at the con and post the art out...except there were 2 pieces going to Germany, one to Hong Kong...it'd be a financial fail. Then my mind kicked in. Sometimes that happens. I'd had an idea. Yet, this time, I knew, I was the idiot. It wasn't Russ, it was me. I messaged everyone I could to let them know I'd failed and I'd see tham Saturday. I got to Perth on Friday morning with time to spare. No bookshop, in fact nothing to buy that was worth reading. It was rubbish. Oh well. I was getting off the train in York so I enjoyed the scenery. It was nice to have a seat booked as I usually had to stand on journeys. At York I managed to purchase the cheaper ticket I wanted and paid £356 for a smoothie and 2 Picnic Bars as I hadn't eaten anything all day. I got a seat on the York to Blackpool train! Unfortunately there was a bloke who smelled pretty rank sat in front of me. That would have been ok but every so often he nutted the window as hard as he could. Once he also did a pretty nifty fake headbut at the window too. He got off in Accrington. I could breathe through my nose again. Russ kindly met me at the train station and I found my folder resting peacefully on one of my art desks, unaware of the angst it'd caused. What a fool, me, not the folder. I made the most of it though, drawing another three sketches (two of them sold on the weekend, no love for Spidey though) and managed to grab a few hours sleep before Russ rang me at 4am to tell me he was on his way! The journey down was without incident. In fact it turned into a really useful brainstorming session for the book series we're co-writing. We've been working on the first book since October 2014 after several years of planning. Well I have. Russ thought he'd cut and paste paragraphs to create a nonsensical, continuity error ridden disaster with characters that were barely ciphers, lacking both personality and emotion. If you think that's harsh, work with him..I dare you. 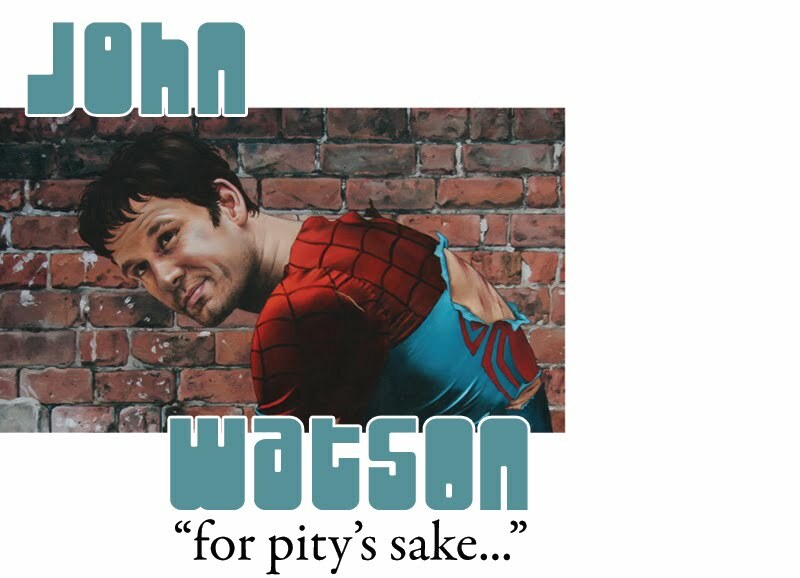 Still, he'd finally come round recently after my fair, if pointed, comments and had removed most (I'm really hoping all) the inane 'comedy' inner monologue that every character he wrote thought in. The copious number of paragraphs about Stanley Park in Blackpool that three characters were seemingly obsessed with have gone too. I wouldn't have objected to them so much if Russ had bothered to actually go to the park and use real locations to describe..instead he just made it up. I've taken it upon myself to rewrite 30,000 words of what I've done (so you don't think I'm being unkind to Russ) to make the latter part more exciting and tighten up the plot. We ironed out a couple of plot holes and the ending is pretty great now. Russ has also apologised for being an egotistical nightmare and has finally stopped trying to cut corners. I accepted his apology. One day the first book will be finished, hopefully for NICE in September. We'll both be posting more information about it as the time gets nearer. We're self publishing it, there seems no point in giving money to an agent so we can earn nothing through a publisher and lose creative control. We arrived in London in time for the con, bumping into Ian Churchill and his wife Sasha at the entrance. Ian was wearing the leather jacket he bought after trying to steal mine at NICE last year. He liked my jeans and shoes this time. But not my Scott Pilgrim hat. Not at all. If you see someone at NICE walking about Bedford in underpants and socks, that's me. Ian will have taken my jeans and shoes. 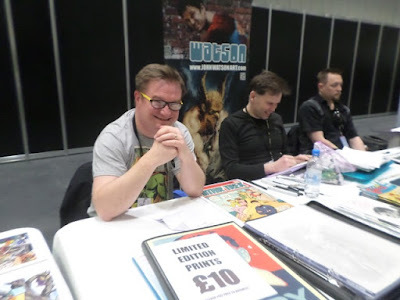 As I mentioned in my posts pre-convention, Barry Kitson was sharing my table for the weekend. The previous night I'd had a message that he was juggling a few deadlines so I guessed he'd probably be a little late for the show. It gave me chance to spread my folders out across the whole table and Russ a place to sit. 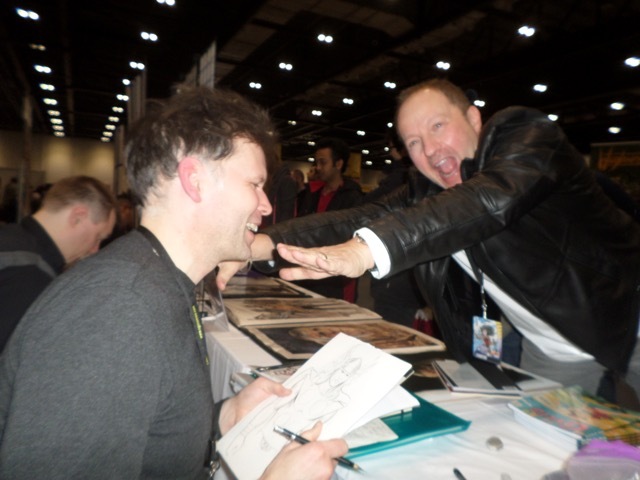 The con was a little quieter this year overall but that gave me chance to chat to JK about a whole variety of things. 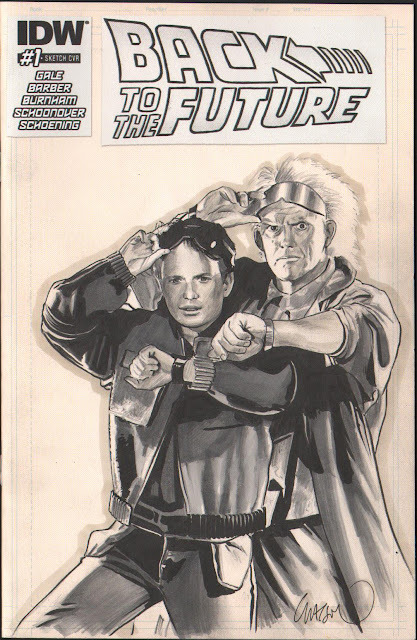 He had the originals for some recent Star Trek covers with him too, really nice art, very reasonably priced also. My sketchlist filled up pretty quickly and I made a start on it. Thing is, I didn't really get any sketching done until after midday as I was busy handing over commissions and chatting to people. I hope everyone was happy with the commissions this year. I did get some pretty good feedback, 'that's the best Wonder Woman I've ever seen,' and 'you should be charging at least three times as much,' being two that I can remember. Both quotes are from comic creators. Which is nice. Thanks go to Ole for the chocolates and biscuits, much appreciated! I hope it's obvious who these guys are. There was one guy who did four passes of the table, each time pausing momentarily to touch a folder or piece of art before moving swiftly on. The toucher...I wonder if he did that to anyone else's table? A lot of people were wondering when Barry would arrive. Someone had an update, 3pm. Sure enough, Barry arrived at 3PM and began sketching straight away, watercolouring some already completed pen and ink pieces. At the end of the show I set off with Barry. He had a car waiting to take us back to his house where I was staying. Russ was staying at his daughter's place somewhere in London. Now, I got a B in Geography at school but I had no idea where Norwich really was before the weekend. Yes, it's South East, but so's London. I figured it was about an hour away. We got to Barry's at 9pm. It was great catching up, chatting about art, books, the industry and horses with Barry and his wife Ally until the early hours. They also have the best dog I've seen for a long while. It's enormous, two of my kids could ride it like a horse. Milo's a cross between a German Shepherd and a Doberman. But giant. And I've now seen Barry's island! Barry made a nifty pizza for us, making the dough from scratch and everything. Barry's always busy so he didn't plan on coming back to LSCC on the Sunday, it was more of a cameo for him, he needed to work. So the plan was to put me on a train from Norwich and I'd be back in London an hour and a half later. Russ had my art and would be there on time so he could man the table. Turns out it'd take about 5 hours to get to London because of some works. And they wanted over £50 for the journey too. After some more research, and some looking at old illustration books, there was a new plan. Barry would drive me to Cambridge and I could get a train there. After leaving a message for Ally who was out riding, we set off in Barry's nifty green Honda sport car (that's all the information I can muster, I have no knowledge of cars at all). An hour to Cambridge, an hour to London, I'd be back at midday. A couple of hours later we arrived in Cambridge. 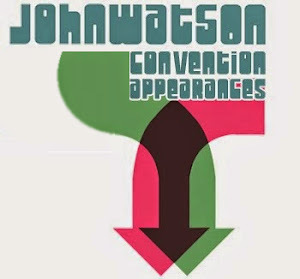 Now, if you've read the account of the 2013 LSCC journey (reprinted in pink at the end of this blog for your convenience) you'll know that Cambridge is a nightmare to navigate. Eventually Barry got the Sat Nav from the glove compartment and used logic to find the station (he typed in Station Road). There was a comical moment in the carpark with Barry trying to get the parking ticket to stay on the dashboard whilst the wind continued to blow it around the car every time he attempted to shut the door. He then helped me find my way through the maze of stairs and walkways to actually get into the station. The next train was at 1320. There were earlier trains to London but they'd get there later as they stopped everywhere. I messaged Russ to let him know I was alive. There were people around him laughing. I hadn't been able to at Barry's as there's no service there for the most part. 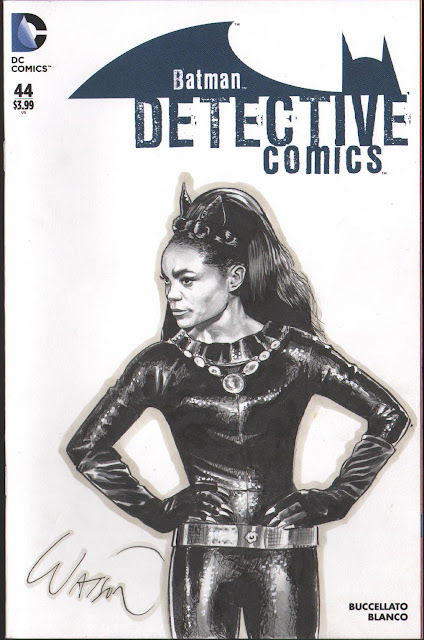 An Eartha Kitt commission that several people commented on in a positive way! For the people who I didn't get the sketches finished for, contact me, I'll either put you on the sketchlist for next time! Trains happen. After the tube and ERL I made it back just after 330pm to much hilarity. In my abscence Russ had been sketching, for £3 a time. Russ isn't an artist. Charging people, kids even, £3 a sketch...and to make it worse, some of my friends bought sketches off him. I know who you are... Someone offered Russ some cover work on Sunday too. They were either being ironic or were unhinged. 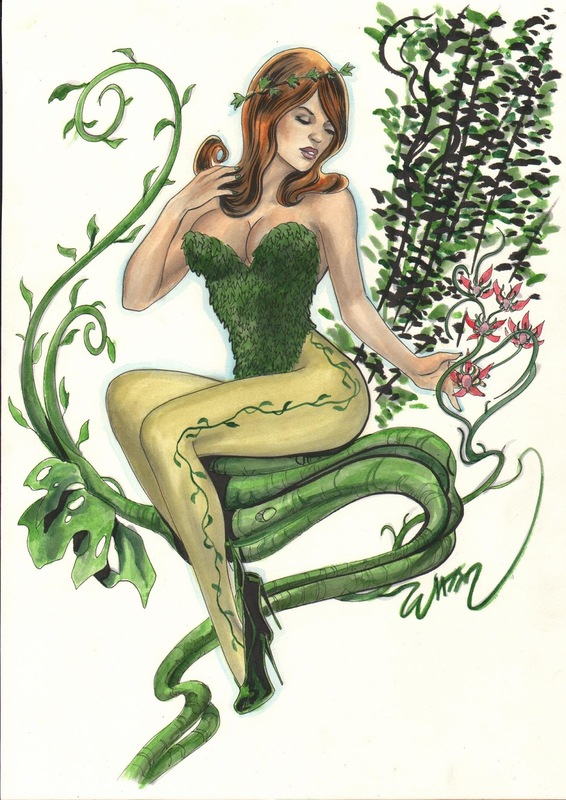 Russ has had a couple of commissions previously at cons. He foolishly posted them online beforehand and the person never came by to get them. I finished the Harley Quinn sketch that I'd started the previous evening and that was it! Oh, and the Toucher made one more pass of the table. 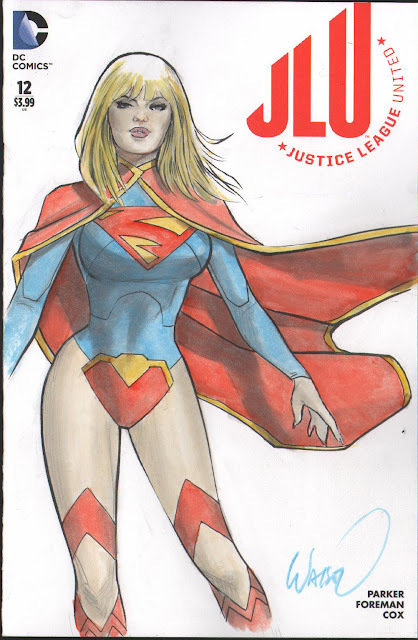 A Supergirl sketchcover I sold at the con. Thought it came out a little Frank Quitely. The word Russ has now become a verb, as in, 'you pulled a Russ'. I did indeed this weekend, I failed several times! All in all it was an eventful weekend. 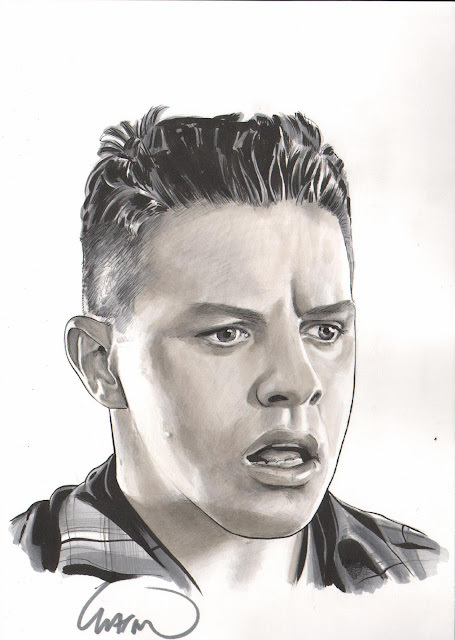 Thanks again to the organisers, to Barry, to all the fans I met and to the people who asked for commissions beforehand. You may be wondering why there's no mention of Jeff from Close Encounters...well, he was really quiet. I think he'll make up for it at NICE in September. The guestlist is great, I'd suggest making the effort to get there! Now, here's a piece I've had for sale for a few cons. I really like it and it deserves to be purchased. Come and buy it at NICE! *I was skiing in Scotland the week before the con last Feb. I gave all my artwork to my friend Russ (see above) so I didn't have to take it skiing. The plan was to get a train from Scotland, meet him in Preston and drive down in his car to Colchester, Russ having brought all my art, booklets, posters etc with him. So, we make good time, get to Colchester just after midnight. We were going to Colchester to my friend Larry's house (he's the one who people think is Mike Collins, no idea what they think when Mike is with us) and then driving to the con the Saturday morning. So I got out my folders to show Larry the new stuff I'd done and also give him the pre con sketches he'd asked me to do. Except the folder with all the commissions in it wasn't there. We spent an hour looking for it. Then Russ denied ever seeing it. I was panicking now. There was a lot of work in the folder...a heck of a lot. I remembered handing the folder to Russ, seeing it on the back seat of his car before I went skiing. He didn't. One of us was wrong. More importantly, where was the folder? Then Russ developed a few theories. One of his daughters' friends had stolen it. Or, it had fallen out of the car into the street outside his house, he hadn't noticed and had been put in a bin...or his favourite, I never gave it to him. Larry came to wake us at 6. But I hadn't slept. Russ snored, the heating was on all night and the central heating pipes banged incessantly all night. Russ waited until 730 and then phoned home. His youngest daughter told him that the folder was where he put it to keep it safe, on top of the cupboard in the back room. Russ still had no recollection of ever seeing it. Relief. The folder of art still existed. So, how to get the folder to London? I phoned my friend Aidy. He can do stuff. He went to Russ' house, got on a train and arrived at the Excel centre just after midday. He had a great time pretending the art was his on the way down, upgraded to first class on the way back. Good day out. So, I only lost half a day, had the art, the commissions etc back! I was at a table where I wasn't advertised as being and had no banner or even a sign. But that's another story. On the Sunday evening we chatted for a while in the bar of the hotel with some artists and friends and then set off home. We needed to drop Larry in Colchester, about as far East as you can get from Lancashire in the UK. After that we headed North West. We were doing fine until, heading towards Kettering, Russ decided, for no good reason at all, to turn left onto the motorway and head back to London. It's a decision he still can't explain to this day. We tried to get off the motorway and retrace our steps. The hour we spent trying to get out of Cambridge was amusing at first. But then it started getting late. There were lots of people riding round on bikes in Cambridge, dressed as old school students. Probably been riding round since the '50's looking for a way out. We thought of just knocking on someone's door and asking for food and shelter for the night...but eventually we stumbled on an exit from the place. We got home at 230am. This year we planned to go on the train, there's a stop literally feet from the entrance to the Excel centre. Thanks for your work on my Chewie and Back to the Future. Seems like you had one hell of a pre con.